We are now only a couple of weeks from the first ever CSUF Titan Alumni 3 on 3 tournament. 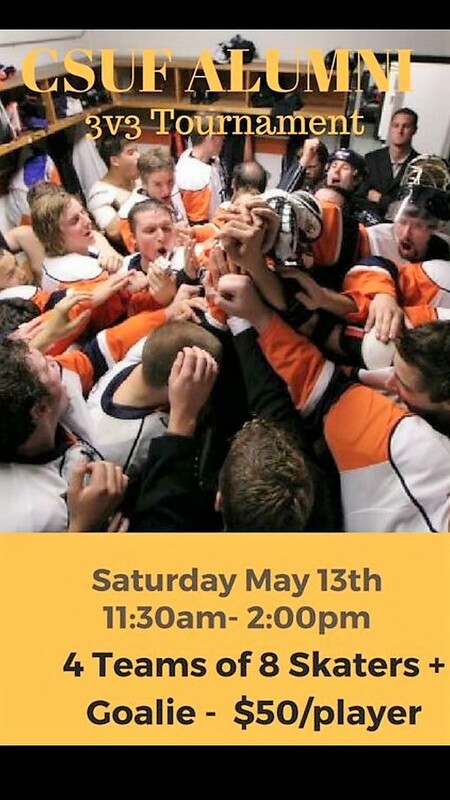 It will be held on Saturday May 13th from 11:30am – 2:00pm at East West Ice Palace in Artesia. Each of the 4 teams will consist of 8 Alumni skates and one goalie, competing in a 3 on 3, NHL All-Star Tournament format. We are down to our final 5 spots for Alumni. If you are interested in playing, contact our club GM at gm@titanicehockey.com and get him your $50 to play as soon as possible. For those interested in coming out to watch the tournament, we will be charging $5 at the door for each spectator. All proceeds of the event go towards funding CSUF Hockey for our upcoming season. We are looking forward to a great turnout for a fun Saturday afternoon!